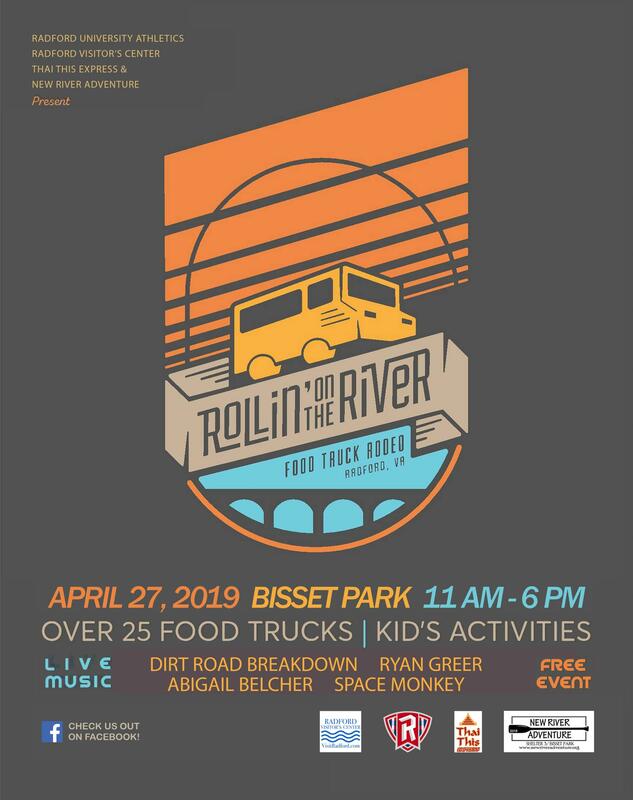 The Radford Visitor's Center, New River Adventure and Thai This Express present the 2019 Rollin' on the River Food Truck Rodeo on Saturday, April 27, 2019 at Bisset Park. Join us in Bisset Park along the banks of the New River in Radford, Virginia for the 2nd Annual Rollin' on the River Food Truck Rodeo. There will be over 25 food trucks with live music, activities for children, and a day full of fun for everyone! Two ATM's will be available on site. The Radford Transit will offer free shuttles from 7:00 am - 6:00 pm from Radford University’s Lot Z and guests are encouraged to use the shuttles to avoid parking congestion. Lot Z is located adjacent to the Radford University Dedmon Center athletic facility at 101 University Drive in Radford, VA. Please note, the Radford University Half Marathon will be taking place in the morning and traffic patterns will be altered for the safety of the runners. Please observe all safety personnel as we work to make this event safe for everyone. To view the event flyer, visit: https://i.imgur.com/6EVz2Bo.jpg. For more information, updated information about vendors and free shuttle service, visit: https://www.facebook.com/events/343776846462132/ or email us at info@visitradford.com.